Rock collecting has never been quite like this! When the class forgets to do its homework, a fieldtrip through the Earth's crust, into the center of the Earth, and out through a volcano will teach them not to forget their assignments again - and then some! Don't miss the all-new Magic School Bus: Rides Again book series and the animated show streaming on Netflix now! Joanna Cole and Bruce Degen, the author and illustrator of the Magic School Bus books, have collaborated for twenty years, bringing humor and true kidlike curiosity to science and learning. Booklist heralded Ms. Frizzle as "the wackiest, wisest teacher in picture books." Two MSB titles have been named School Library Journal Best Books of the Year, and they have won countless state book awards, from New York to Nebraska. Bruce Degen is the bestselling author and illustrator of the beloved, perennial favorite Jamberry and numerous award-winning books for children. 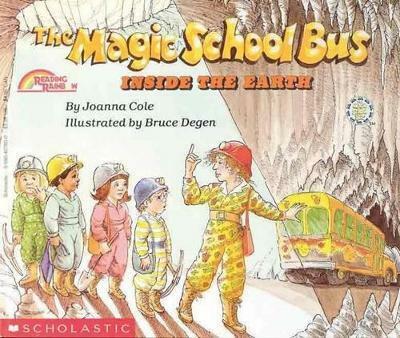 He is also the illustrator of the highly-acclaimed Magic School Bus series by Joanna Cole.